I have a troy built 45 and it pulls hard to the left. I have tried adjusting the machine and some times it better then it gets hard? Is the cut that it isn taking to wide and then drive way a little un even?? Will your product help? 1) tire pressure - nobody ever checks tire pressure and it can cause the machine to put more weight on one side than the other. This can cause turning, and…. 2) Unevenly worn scraper bar. The scraper bar should not touch pavement ever - it should be set to be just a bit higher than the pavement. 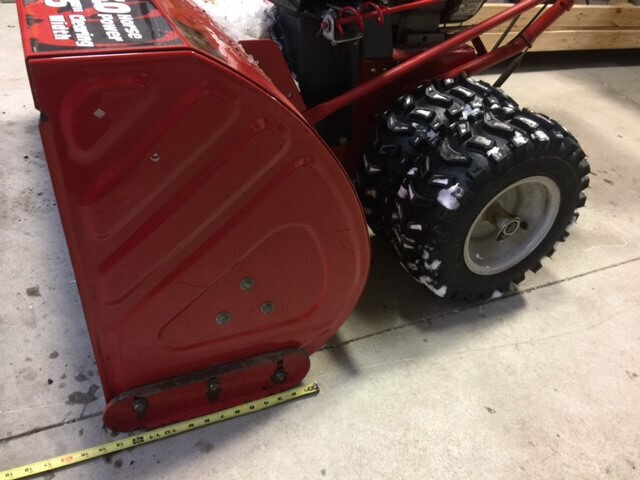 I like to use a paint stick under each side when I set the height of the snowblower by adjusting the…. 3) snowblower skid shoes. If you have one worn more than the other, or even if you don’t - pavement can grab and turn your machine quite easily. Small skid shoes create a large amount of friction, and this can easily grab pavement and turn a snowblower. What you need is a larger skid shoe that glides better, like…..
You could also have any one of a number of other issues going on, but eliminate these first is an easy way to go. Then you can start looking at other issues such as the axle/transmission, etc. Oh one more thing: Most snowblowers have a pin on one wheel where you can choose to have just one wheel drive and one free spin, or both drive all the time. Check and see if you have it in free spin mode or dual wheel drive mode. That will also definitely turn a snowblower. What skids do you recommend? That’s got two drive wheels on each side, right? If it does, the machine has three bolts. Is that correct? If so I think you might be at a 9″ total distance from bolt 1 to bolt 3. I need you to verify it though by measuring. Put a piece of masking tape across the skid just above the mounting bolts. Then take a marker and mark on the tape the center of each SLOT that has a bolt in it. Focus on the slot, not the the bolt. Frequently the bolt can be shifted a bit and be misleading. Then you can pull the tape off, take it inside, stick it to your kitchen table, and measure much more carefully and accurately than bending over kneeling on the cold ground. If you find you have a 9″ measurement, then you are looking for the ase9575-C. I hope this helps! If you wouldn’t mind, I definitely want some pictures of this machine when you get my skids mounted. Yes it is 9″ between the 1-3 bolts. Enclosed is some pics. The machine is digging in on the left side and the scrapper is definitely dragging. I lifted the scraper for the moment. The. ASE9575-C. Is the one I need? If so I will order it on your site ?